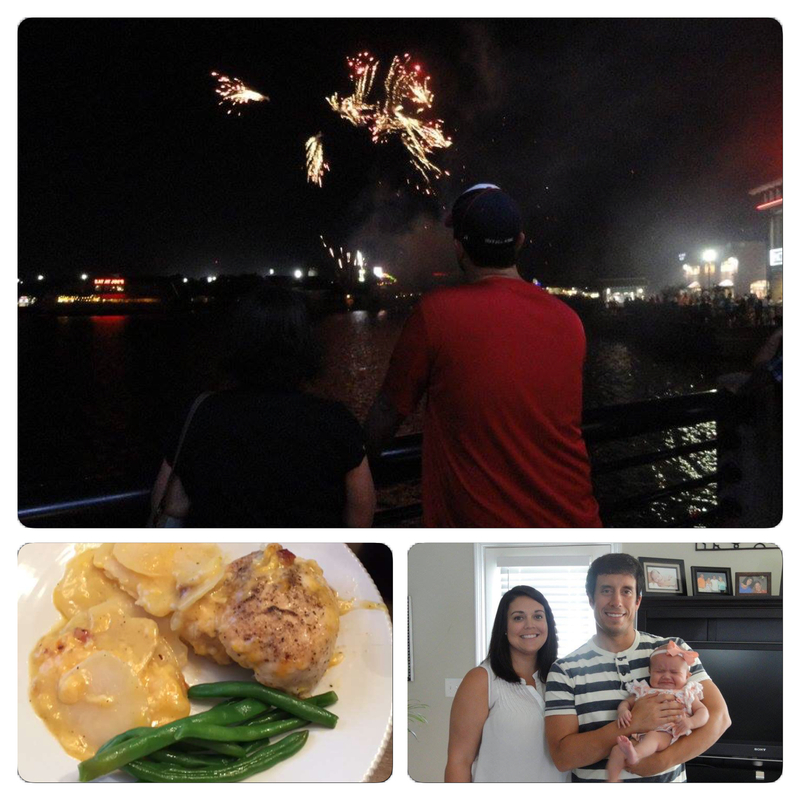 Fourth of July – Right now I am thinking about the Fourth of July and I am saying to myself, Oh my gosh, is it really next week?! Time is going by fast! But I am also saying, I can’t wait. 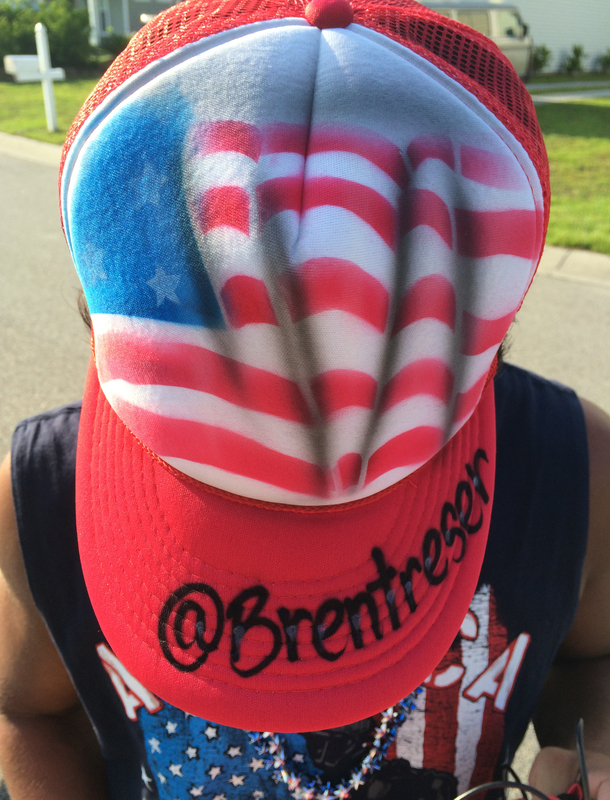 I am a big fan of the Fourth of July. I enjoy the vibe around the holiday, I love the patriotic displays, and I just treasure that it is synonymous with summer!! Yep, there is nothing that screams summer louder than the Fourth of July. We don’t know exactly what we will be doing for it yet, but you can be sure that we will find a way to properly celebrate the Red, White, and Blue. I absolutely love the Fourth of July. Big Brother 19 – The season premiere of “Big Brother” was last night. This will be my third season watching the show and from what I saw yesterday evening, it will most likely be my favorite. The cast, the theme, and the “temptations” all seem pretty solid. Now that “Big Brother” has started, our summer has officially started! This season, I want to see Christmas (33-year-old crossfit extraordinaire…and yes, that’s her name) and Kevin (55-year-old dad with seven children) do well. I am picking Matthew to win, however. Big Accomplishment for #CCUSocialMedia – If you are my friend on Facebook, you might know about this, but I would like to share with my readers as well. This week, the Higher Ed Social Media Report was released. Using engagement metrics, the report puts all Division I colleges on equal footing and calculates the social media impact of each institution. Coastal Carolina University graded out extremely well. 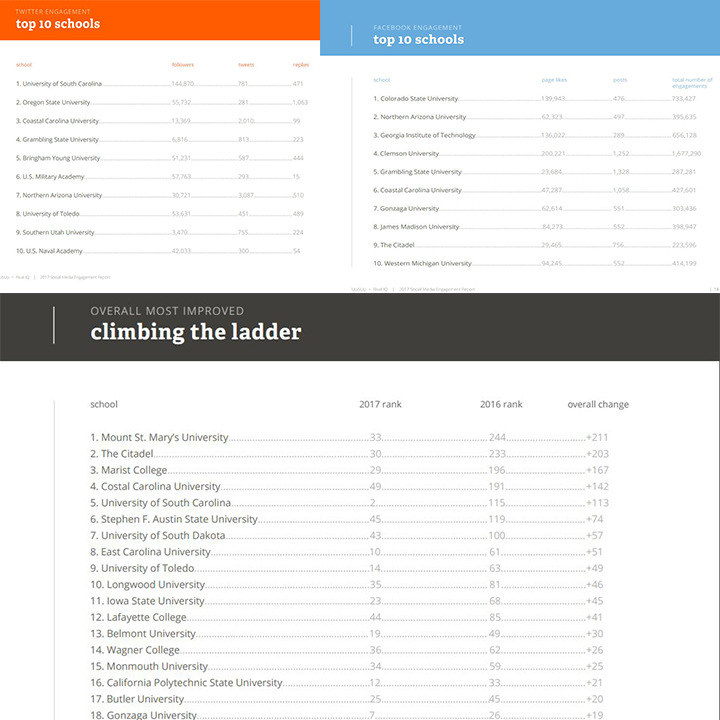 Out of 300+ colleges, CCU was tagged as having the #3 most engaged Twitter account in the country. When it came to Facebook, we were judged to have the #6 most engaged account. Overall, we improved tremendously, going from the #191 social media program in the country to the #49 social media program country. How could a young institution that was founded in 1954 rank so high? It is because at CCU we have leaders who embrace social media and a team of content creators (photographers, videographers, writers, designers, interns) who continually support the program with their talents. Also, when you have a social media audience as passionate as #TEALnation, it makes things much easier. Special shoutout to my counterpart and friend at the University of South Carolina, CJ Lake, for taking her school’s program to new heights as well! To download the report, click here. 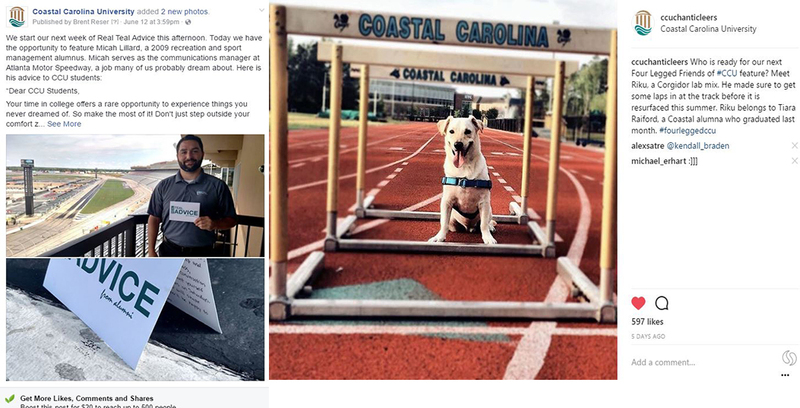 A look at where Coastal Carolina University stands when it comes to social media. Sloan Photos of the Week – Tomorrow our little girl will turn 15 weeks. She is now laughing and is “talking” more and more. Her kicking has not slowed down one bit. She is about to grow out of size 1 diapers and she is a true milk monster, gobbling down those ounces at an astonishing rate. Here is the latest photo collage. 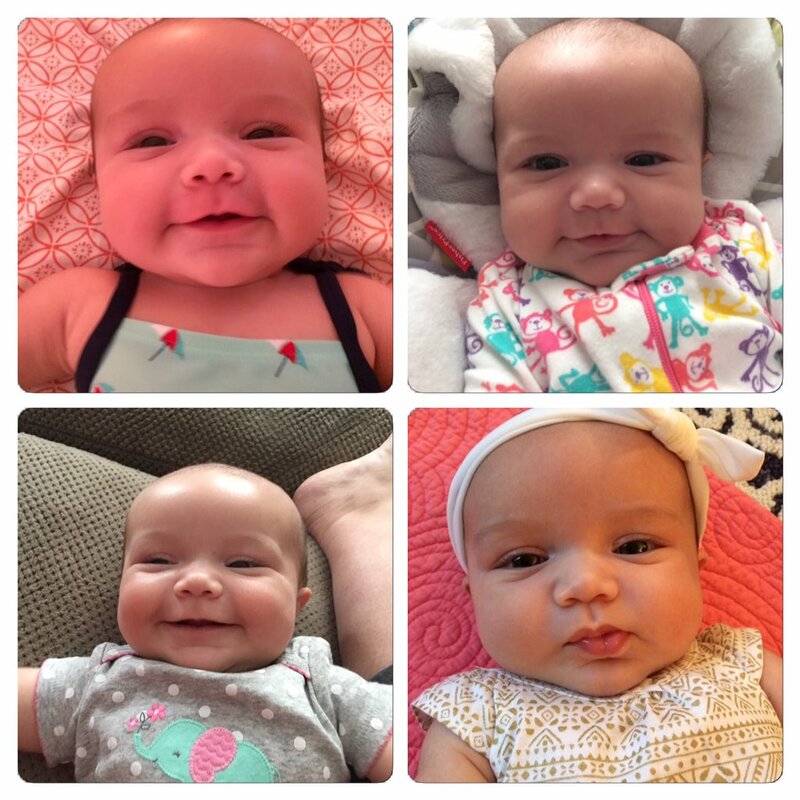 Here is the latest photo collage of Sloan. Gas Update – Every now and then I brag about the gas prices in South Carolina. This morning when I went by a gas station near campus, I took the below photo. That’s right, a gallon of gas is $1.85 in the Myrtle Beach/Conway area right now. Talk about a Fourth of July gift! I thoroughly enjoy living in a place where gas prices routinely hover under the $2 mark. 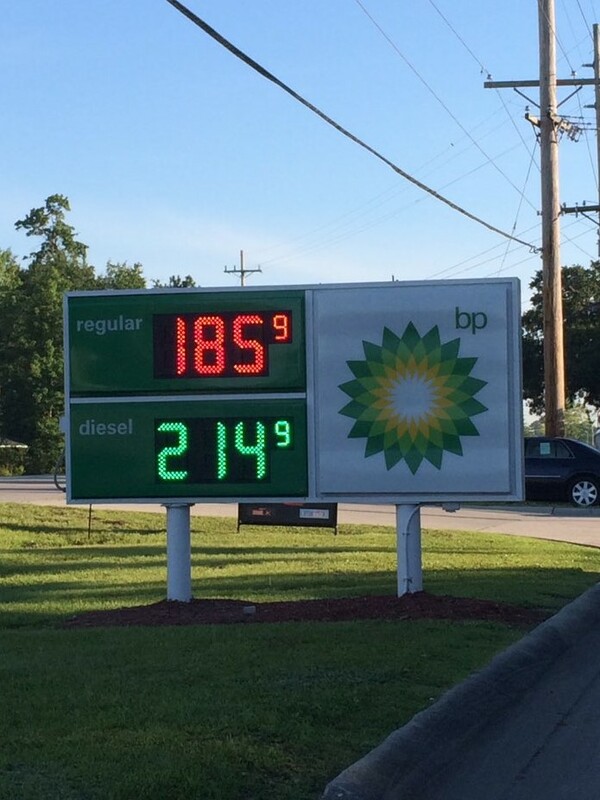 The gas was $1.85 per gallon in Myrtle Beach today. Like I said above, enjoy the rest of your June. Thanks for reading and I wish you a great weekend. Don’t Blink. This morning, I said goodbye to my mom and brother as they started off on their 17 hour trek* back to the west coast. Because their time in Myrtle Beach was so wonderful and because we will all be reunited again in a short couple of weeks, it wasn’t an emotional farewell like it sometimes is. This time it was all about hugs, smiles, and dry eyes. My mom and Glen came to South Carolina for Sloan’s baptism. They definitely accomplished their objective. While I hope to go into detail about the baptism ceremony in a separate blog post, for tonight I want to just recap the special weekend we all had. It was a blessing to have my mom and brother come to Myrtle Beach for Sloan’s baptism weekend. Thursday: I arrived home from work to find a couple travel weary visitors! Well, at least one travel weary visitor. My brother was asleep on the couch while my mom was holding Sloan. It was so great to see my family members again in the flesh. Sidney, Sloan, my mom, and I went to the grocery store to buy groceries for the weekend while Glen slept off his jet lag. By the time we came back home and stocked the shelves, we were ready to go out to eat. Because both my mom and Glen had never seen Downtown Conway before, we went there and ate at Rivertown Bistro, the town’s most well-known restaurant. Sidney’s parents met us there and we had a delicious dinner that really impressed my mom. We came home and watched a new dating show called “Love Connection” and I made us all ice cream sundaes. On Thursday, my mom and brother got to hold Sloan after a long trip to get to Myrtle Beach. I also made some pretty refreshing sundaes. Friday: I worked a half day on Friday. When I returned home, it was almost deja vu from when I walked in on Thursday. Mom, Sidney, and Sloan were conscious while Glen was asleep on the couch. I woke him up and the two of us went to satisfy one of my brother’s requests for the trip…eat at Chick-Fil-A. We scarfed down our spicy chicken sandwiches and enjoyed each other’s company. We returned home and the five of us (I am including Sloan) talked in the living room. We then all went to a children’s clothing shop and picked our a baptism gown for Sloan. Glen, Sidney, and I then went to a local watering hole called Longbeards to have a couple drinks and swap stories. When we finished there, we came home to a very content lady who was enjoying every second with her granddaughter. 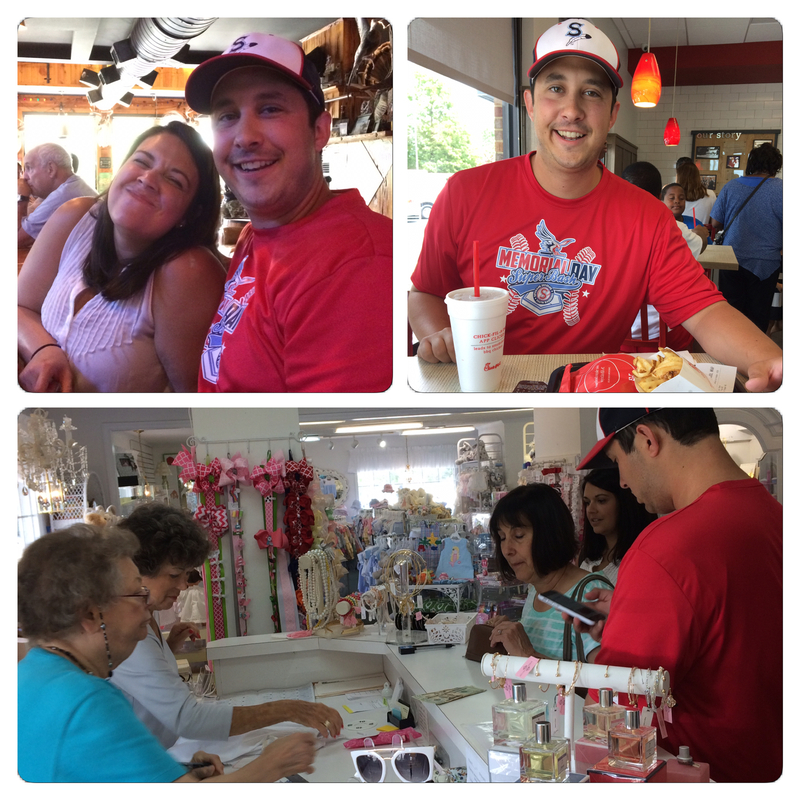 During the day on Friday we went to Chick-fil-A, purchased a baptism gown for Sloan, and went to a place called Longbeards. For dinner, Sidney made a cheesy potato casserole dish that was delicious. We ate and then watched Jeopardy. My mom then watched as Sid gave Sloan a bath and put her down for the night. With Sloan sleeping soundly, my brother, mom, and I went to Broadway at the Beach. We walked around the revitalized area on a warm evening as we bought salt water taffy, watched a fireworks show, and sat out on a back patio of a frozen drink establishment that overlooked the water. We then came home and ate a midnight snack of peanut butter chocolate chewy bars that Sidney had baked. The fireworks at Broadway at the Beach were great. Sidney cooked an amazing dinner (cheesy chicken potato casserole). Saturday: With my mom, Sloan, and myself the only ones up at around 7:30 a.m., we went for a walk around the neighborhood. My mom and I took turns pushing the stroller as we took Sloan all through our residential area. We came home from the walk and replenished ourselves with breakfast. Glen and Sidney soon arose for the day and they joined me for a fun outing. With grandma taking care of Sloan, the three of us went down to the Boardwalk. We played a baseball antique arcade game that was also one of my brother’s requests while throwing our money into the many other games offered at the area’s arcades. We found a bar to hydrate at before playing 18 holes of putt putt. We went to the Captain Hook course where I came out on top. We came home and then my mom and I went right back out the door to pick up ingredients for dinner. She enjoyed her first experience at Publix as we purchased blue cheese stuffed and cheddar cheese stuffed hamburgers. Once we returned home, all of us got ready and we went to St. Andrew for 4:30 p.m. mass. We worshipped in the place where Sloan would be baptized the next day as she practiced by once again being a great baby in church. After the service we drove back to the house and Sid cooked up the burgers. A little while after we ate, Sid went to the store and bought the Family Feud home version game for us to play. It was a lot of fun as we all did our best Steve Harvey/Louie Anderson impersonations. With grandma more than happy to watch Sloan so the three of us could continue to have fun, we went to the newly opened Dave & Buster’s. I will write more about this experience later but we had a really fun time. When we exhausted the funds on our D&B cards, we walked to American Tap House where we had a beer and watched baseball. Once back at home, we chatted with my mom who was still up. 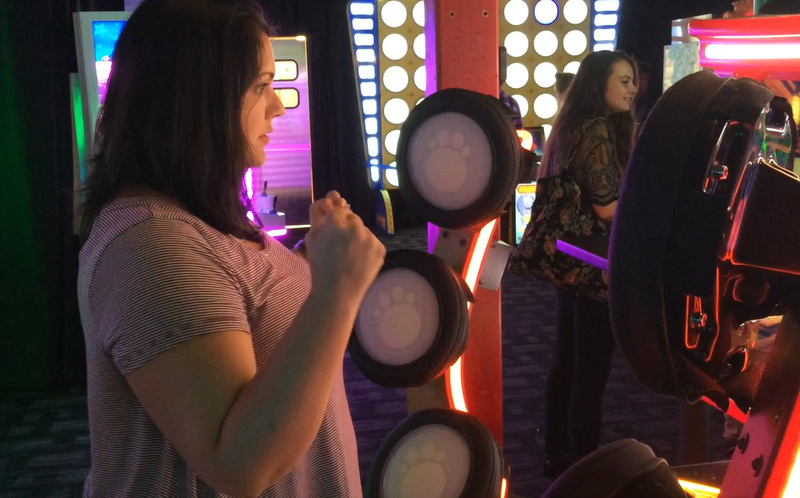 Saturday was a fun day spent at the Boardwalk and Dave and Buster’s. We had some excellent hamburgers as well. Sunday: This was the big day! We woke up and lounged around the house for most of the morning. Once we were all ready, we headed off to St. Andrew for Sloan’s 1 p.m. baptism. Deacon Robert Jones officiated the ceremony and did a great job explaining what was going on and welcoming everyone who was there. In front of family and friends, Sloan didn’t make a sound as she was baptized in the name of the Father, The Son, and The Holy Spirit. At the conclusion of the sacrament, we took time to snap photos of the joyous occasion. We left the church and returned home to change. We then went right over to the house of Sidney’s parents for a lunch reception. All of us talked and enjoyed each other’s company as we ate fried chicken, numerous sides, and peach cobbler. Sidney and I also opened up Sloan’s baptism gifts. Once the reception in Sloan’s honor concluded, I went to the mall with my brother and mom. Once back at the house, Sidney set up the Wii as her and Glen competed against each other in various games. With most of us full from lunch, it pushed us to have a late dinner. Sid, Glen, and I ordered pizza for carryout. While our order was prepared, we went to the neighborhood tavern for drinks. It was a low key environment and a great opportunity for us to relax and recap the trip. We returned home with the pizzas and we ate in the living room while we watched TV and I posted photos to Facebook for my mom. We then indulged in ice cream and watched a movie. We made the most of the brother’s and mom’s final night in Myrtle Beach. This brings us back to this morning’s joyful goodbye. I am so thankful that my mom and brother sacrificed so much to come to Myrtle Beach for Sloan’s baptism. It was a memorable weekend. Don’t Blink. * This is no joke. I am not exaggerating. Due to time in the car, time in the plane, and a couple layovers, my mom and brother are traveling for 17 hours today. It will be 3 a.m. on the east coast when they arrive in Spokane. Arrival of Family – They are here! My mom and brother arrived in Myrtle Beach this afternoon. 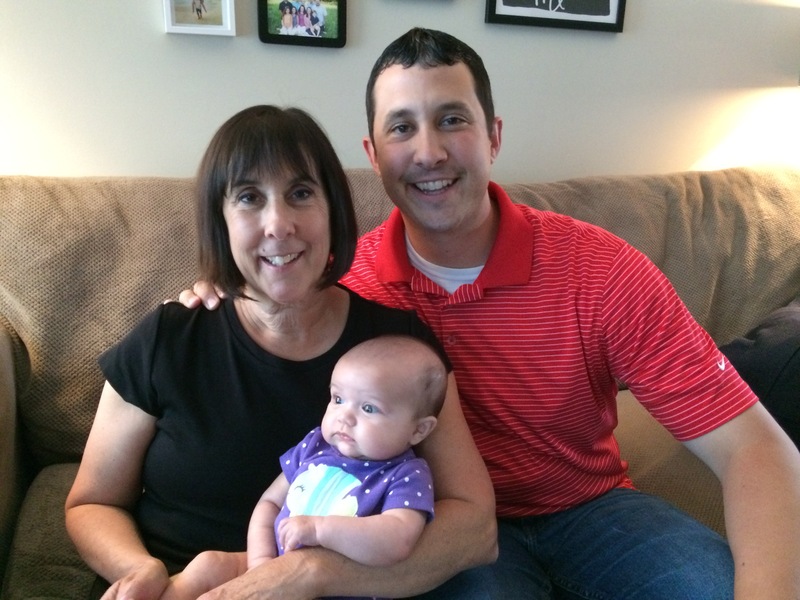 My mom is once again reunited with her grandchild and Uncle Glen had the pleasure of meeting Sloan for the first time. All is right with the world! Grandma and Uncle Glen have arrived! 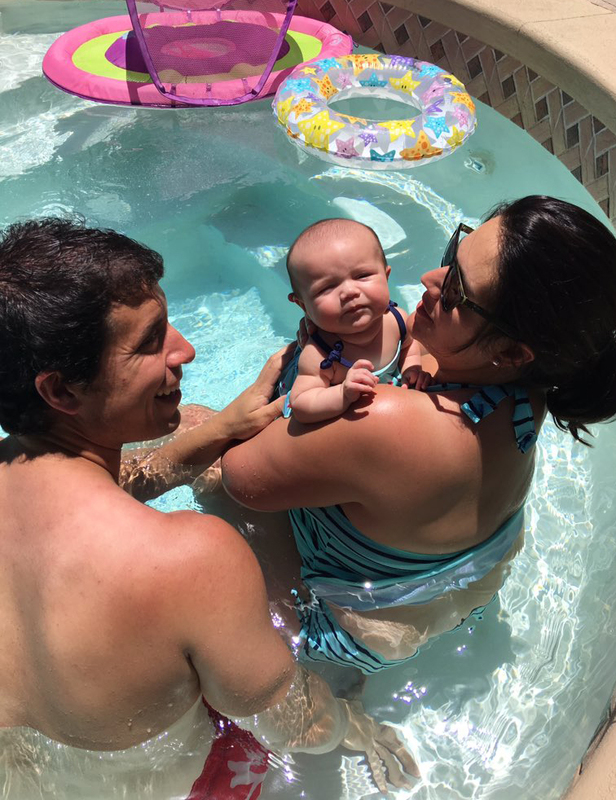 Sloan’s First Swimming Pool Experience – Our daughter LOVES baths. She sits happily in the water and doesn’t flinch while her mommy cleans her. Based on her performance in the bath tub, we thought we would go a step further. On Saturday, Sidney’s friends (and my new friends), Caylee and Kevin, invited us over to their house to swim. When the time seemed right, we gently ushered Sloan into the pool. She wasn’t quite ready. When Sidney dipped her little legs in the water, Sloan voiced her displeasure. Oh well, she still looked super cute in her swimsuit. Sloan wasn’t too happy when we put her in the pool for the first time (thanks to Caylee for the photo). 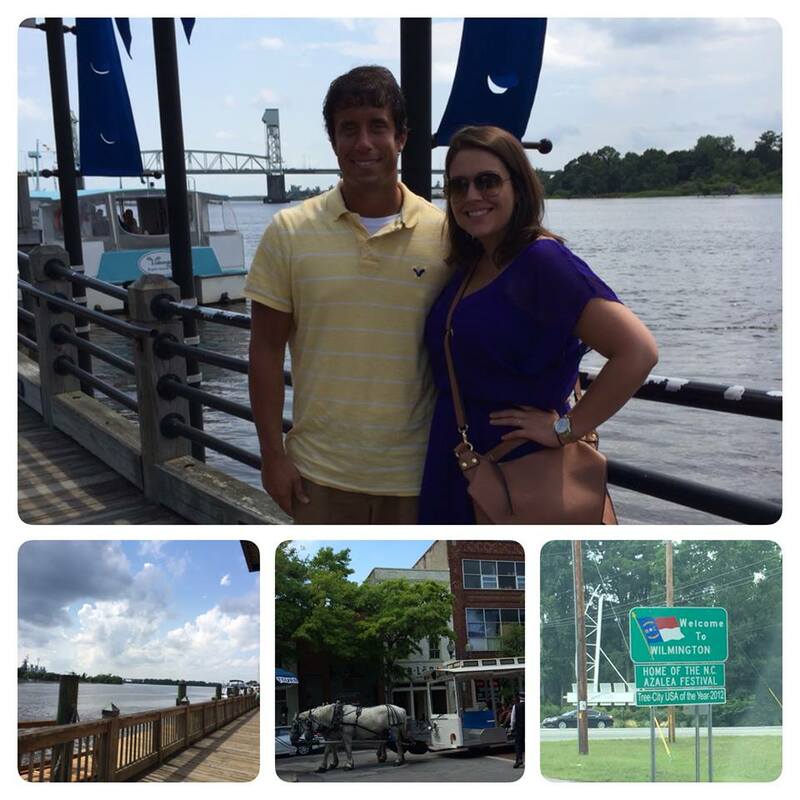 An Amazing Southern City – Three years ago on this date, Sidney and I returned from a trip to Wilmington, North Carolina. I was so impressed with our weekend excursion. The charm and history of the city danced together with sweet grace, giving off an incredible vibe. Dare I say that I even liked it better than Charleston? Anyway, as you can tell, I remember our little adventure very fondly, and I am thankful to our friends, Kendra and Josh, for hosting us. 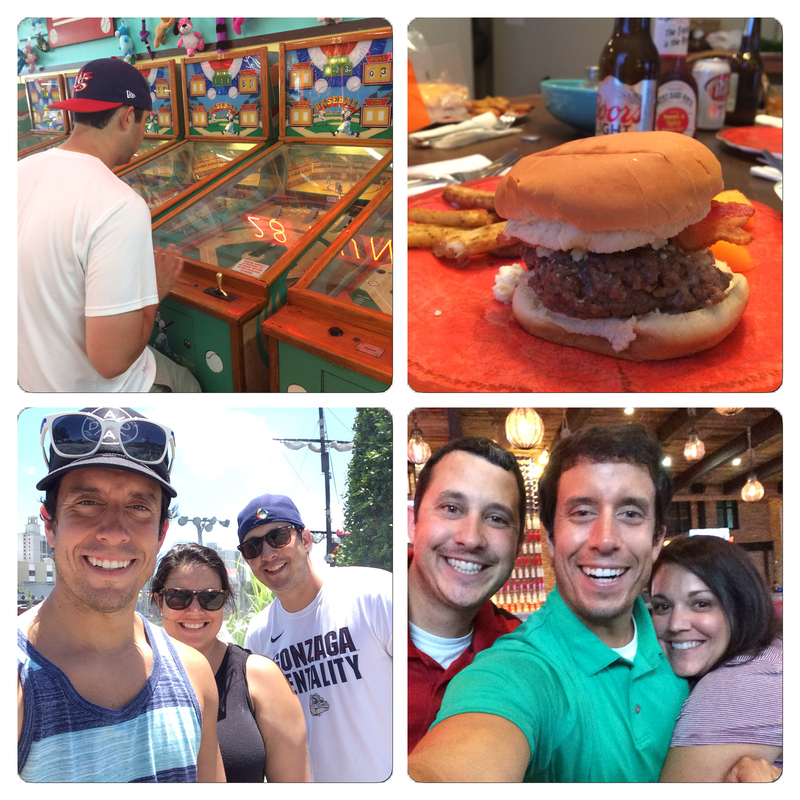 Here is the post I wrote on June 22, 2014 reflecting on our experience. Sidney and I enjoyed a great trip in Wilmington three years ago. 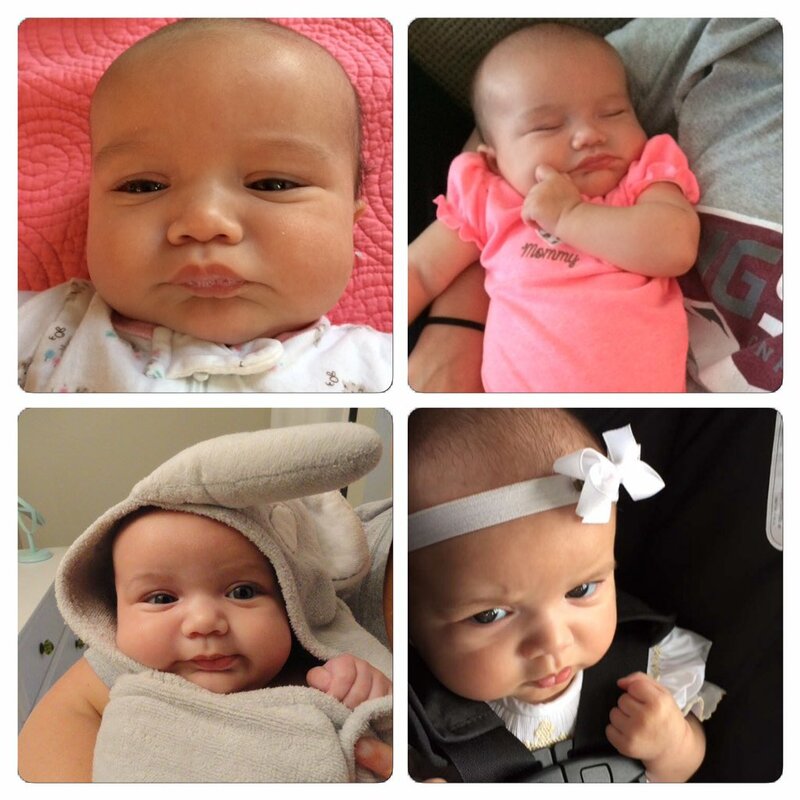 Sloan Photos…The Latest – Sloan turns 14 weeks tomorrow. 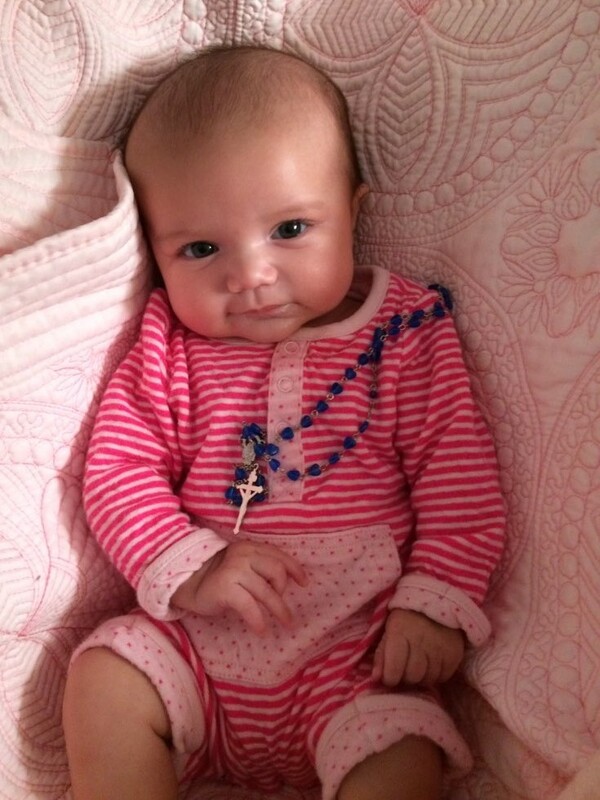 On Sunday, the same day as her baptism, she will turn 100 days old! She is smiling all the time now and she continues to kick her feet continuously. One of her new habits is to put her hands into her mouth. She is our little bundle of joy! Sloan is a very happy girl these days. Bragging About CCU – We all know that Coastal Carolina University is on the rise. The campus is growing, applications are increasing, and the academic offerings are expanding. Also, CCU is now an FBS school and is still (at least for another week) home to the baseball national champions. But how about the impact the University has on our state? 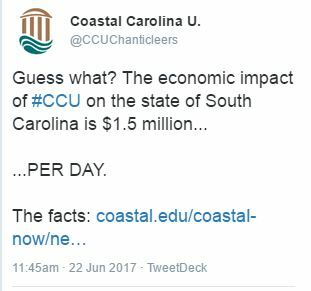 According to a brand new study, Coastal Carolina generated more than half a billion dollars for the state of South Carolina in 2016. For those willing to do the math, that is $1.5 millions dollars per day. I am proud to work at a college that not only excels in every area but also contributes to the state’s economy. Coastal Carolina University is doing a lot to help the state of South Carolina. Okay, I got to go hang out with my family now! Have a wonderful weekend. Don’t Blink. Because it only happens 2-3 times a year, I get really excited when I have the chance to see my family. In fact, the happiness I feel on the eve of these reunions usually causes me to write. Tonight is no different. Tomorrow afternoon, my mom and brother will arrive in Myrtle Beach. They will stay with us through the weekend before departing on Monday morning. They are coming for a significant event: Sloan’s baptism. This Sunday, my brother and mom will be in this very church they are standing in for Sloan’s baptism. 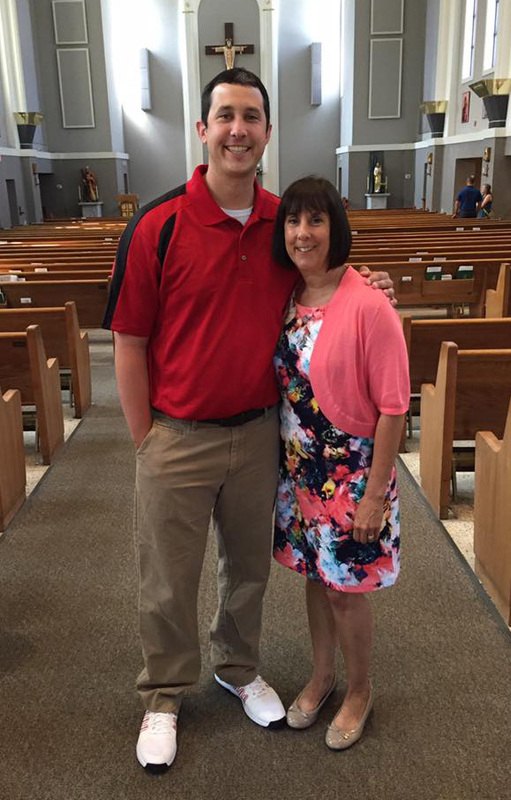 On Sunday, Sloan will be baptized at St. Andrew Catholic Church, the same sacred place where Sidney and I said “I do” a little over a year ago. 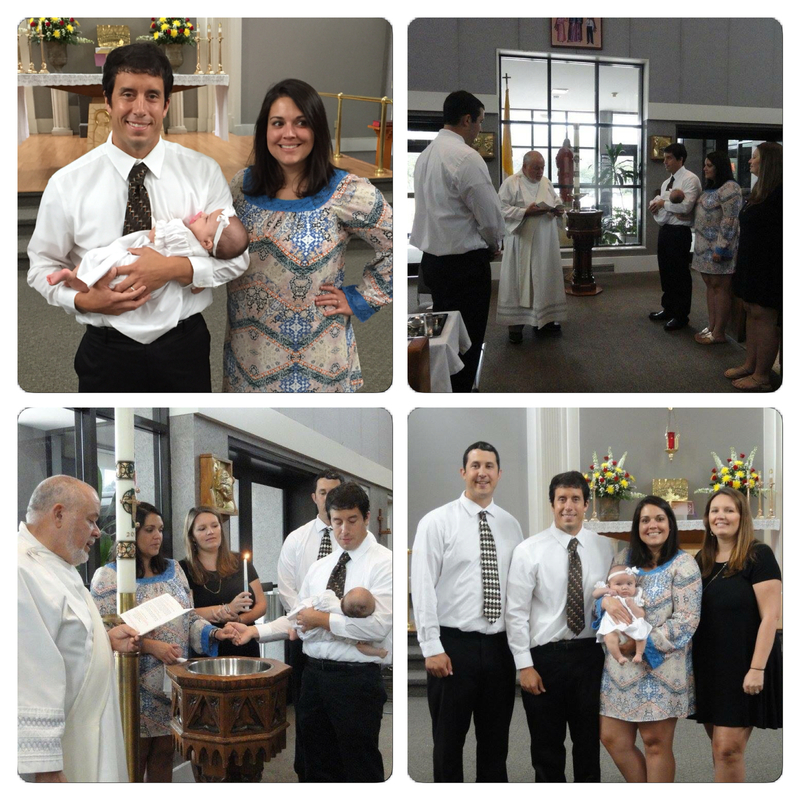 Since the day Sloan entered the world, I have looked forward to her receiving the sacrament of baptism. As evidenced by the way she behaves in church, she has too! My brother served as my best man at my wedding and he will begin his Godfather duties at Sloan’s baptism. Glen will be an excellent faith mentor to Sloan and I am humbled that he has agreed to travel so far to attend the ceremony. Stephanie, Sidney’s sister, will make the perfect Godmother. Sloan is ready to be baptized on Sunday! While the baptism is the main event of the weekend, I am just pleased to have my brother and mom around for a few days. This will be Uncle Glen’s first time ever meeting Sloan. He has told my mom that because it is his initial visit with his new niece, he should have the right to hold her first. I don’t know if my mom likes that idea. Whether or not my mom holds Sloan first or second, one thing is for sure: My daughter is happy to see her grandma! 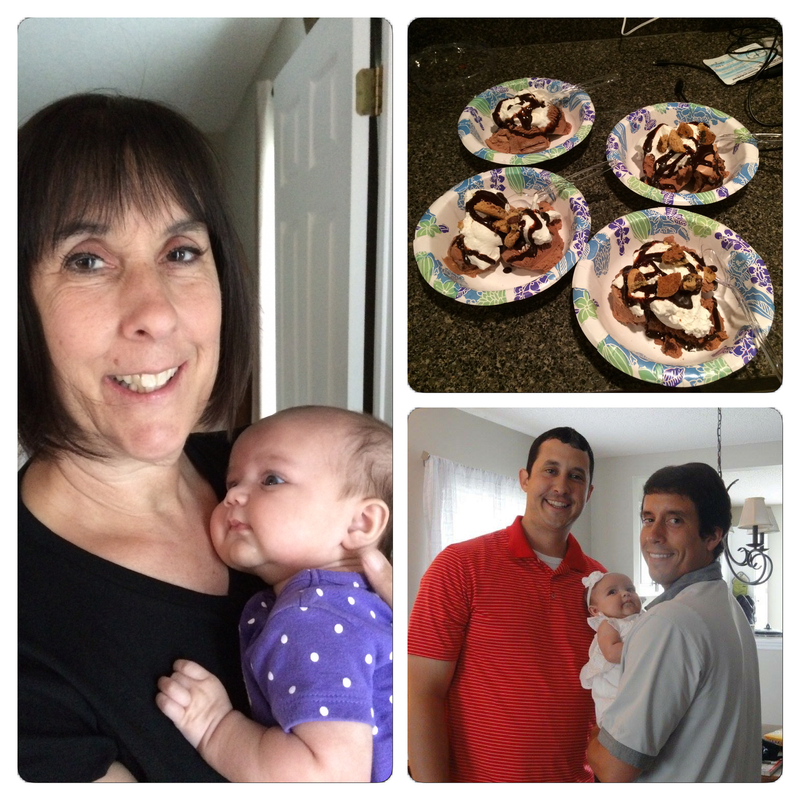 When my mom came to visit us in April, she did so much for Sloan (and for Sidney and I). I know our little girl has remembered those several days and has been anticipating grandma’s return. As always, I love it when my family from the west can be with my family from the south. It is going to be a memorable weekend and I can’t wait for the many blessings that are on the horizon. Don’t Blink. Last week, we had our friends and Pre-Cana marriage counselors, Tim and Kathy McCormick, over for dinner. When we arrived at the dessert portion of the meal, Tim asked whether I had ever written a blog post on my favorite desserts. While I had written about my favorite fast food desserts, I have never addressed my favorite homemade desserts. That all changes tonight. 5. Homemade Ice Cream Sandwiches – When I was younger, my mom would make homemade ice cream sandwiches on two occasions: for my birthday so I could bring them to school for my classmates and also during the middle of summer for those hot July nights. My mom would take two of her homemade chocolate chip cookies, cram a generous portion of ice cream between them, put each sandwich in an individual ziplock bag, and freeze them. At the time, I thought I was getting two desserts in one. They were so fresh, so cool, so refreshing. 4. 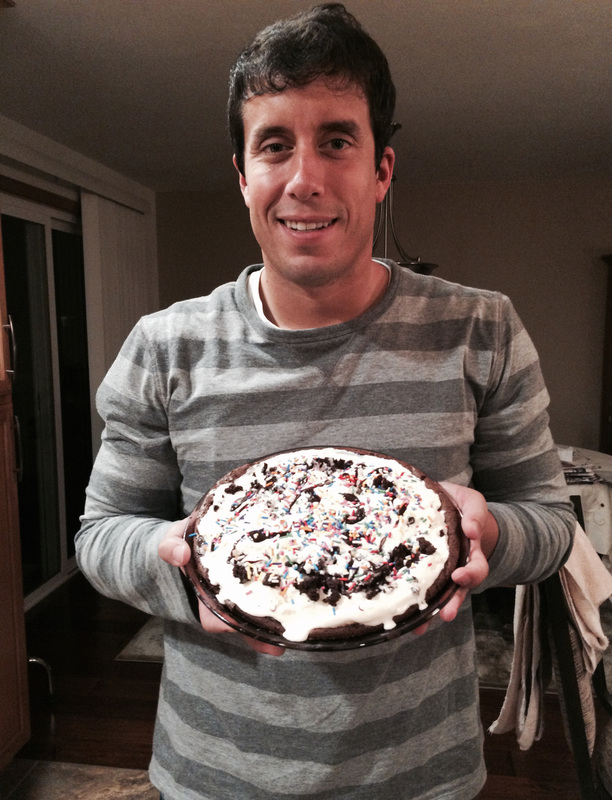 Candy Bar Cake – The first time Sid ever baked me a cake was for my first birthday spent in Myrtle Beach. She surprised me with a candy bar cake. 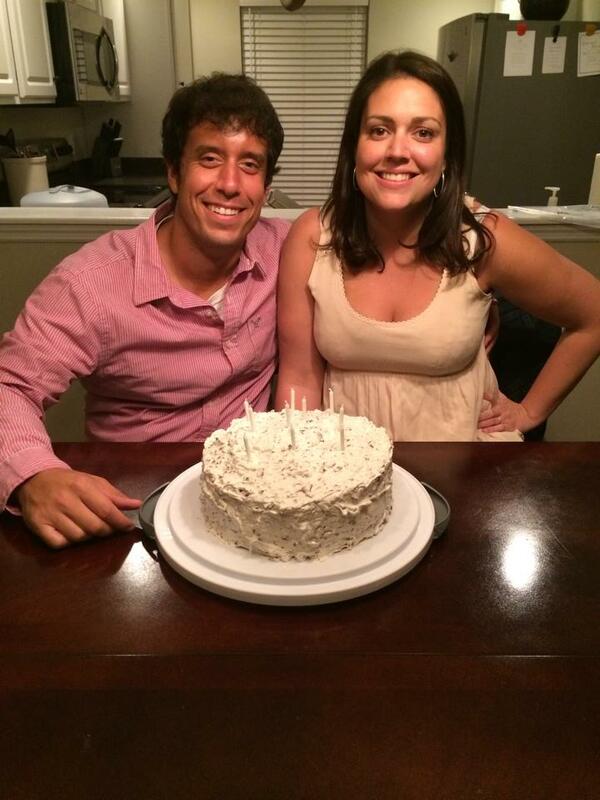 It was chocolate cake on the inside coated in frosting that was mixed with crushed Hershey candy bars on the outside. I am not kidding, Sid probably ground up five or six candy bars for that dessert. Every bit of real estate on that cake was covered with candy pieces. It tasted perfect as each bite contained the perfect amount of cake, frosting, and chocolate bar. Sidney made me this delicious candy bar cake for my birthday. 3. Darn Good Chocolate Cake – This is the Mary Reser (my mom) classic. Baked as a pound cake, my mom has made this for years, usually for New Year’s Day. She uses chocolate cake mix, chocolate pudding, and a bag of chocolate chips for the base of the cake itself. She then frosts the entire thing in a thick chocolate frosting. We then eat it hot with a scoop of vanilla ice cream. I love rich desserts, and this delivers. 2. Ice Cream Pie – After you eat my mom’s ice cream pie, you will never want a traditional cake for your birthday again. While my mom made us ice cream sandwiches for our school birthday celebrations, she made us ice cream pies for our family celebrations. How much do I love this dessert? I once wrote a whole blog post on ice cream pie. My mom would start with a brownie crust. She would then let the birthday boy or girl select his/her favorite ice cream to fill it with. She would then top it with fudge, candy, cookies, and sprinkles. Probably weighing in at 1,000 calories per slice, I loved this Reser family tradition. Me holding one of my mom’s delicious ice cream pies. ……………..with the dessert AND Sidney! It was everything I crave in a dessert: rich, heavy, chilled, easy to eat. It also used a main ingredient that I am slightly obsessed with. The dessert is a mixture of peanut butter, cream cheese, and whipped cream (plus other things such as heavy whipping cream and sugar). Sid then spreads it over an Oreo cookie crust and serves it with more whipped cream. Although the serving size is just a small sliver of a piece, I can easily gobble down two large pieces. It is so addicting and so good. As you can imagine, this is the dessert we had when the McCormicks were over. 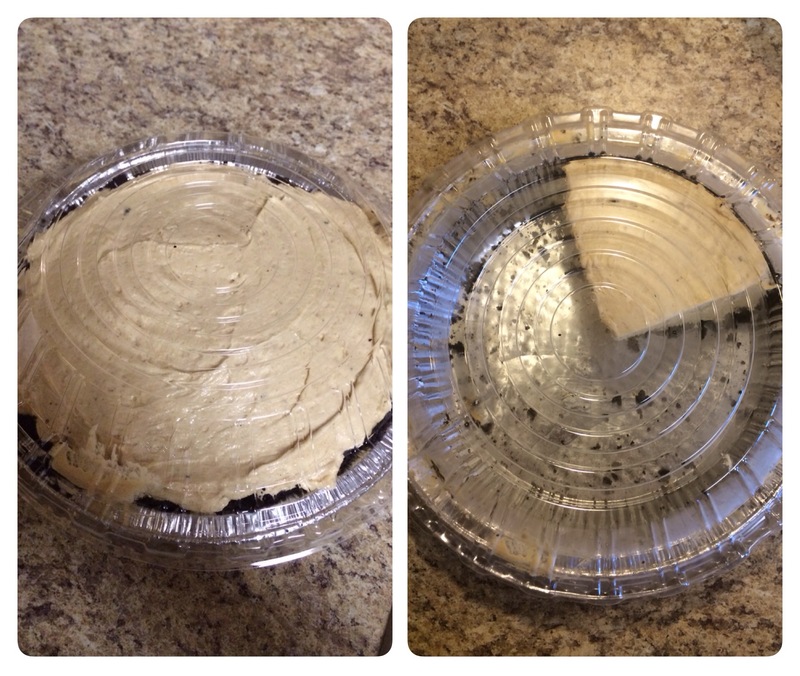 On the left is a peanut butter pie made by Sidney. On the right is what it looks like after I am through with it. Sorry to my health nuts out there, no healthy or fruit desserts on this list! Not that I don’t like those too, but my favorite dishes are the ones that pack the calories and the flavor. Do you have a favorite dessert you would like to make me? Just let me know. Don’t Blink. When it comes to getting behind the wheel, I am a little bit of a grandma. Although I have received a couple speeding tickets in my lifetime, most of the time I am very cognizant of the speed limit. I also follow all other road regulations, I let people cut in front of me, and I slow down instead of speed up for yellow lights. It isn’t that I just refrain from making low risk moves, I sometimes yield toward caution in such an extreme way that I probably put myself and others in danger. Sidney is the exact opposite. She will tell you that she is a crazy driver. Heck, what do you expect after years of driving in Myrtle Beach? She is a speed demon. Not wanting to let oblivious tourists mess with her plans, Sid will do what she feels necessary to get the upper hand on the road. So, you might be asking, what is it like when the two of us drive together? I must be honest, Sidney is a much better backseat driver than I am. If I extend a 10 minute drive into a 15 minute drive, she doesn’t say much. If I drive contently in the right lane for a little too long, she will usually just let me be. If I neglect to turn out onto a road because I feel a certain break in traffic doesn’t give me ample time to do so (even though it does), she won’t give me a hard time. Although I don’t necessarily try to, I am much more of a nag as a passenger. Don’t call me a backseat driver, call me a backseat babysitter. My foot is constantly on the imaginary brake, I clutch the interior handle, and I brace myself when she starts to decelerate. If Sid is on her phone, I will subconsciously shoot glances her way. Usually she puts up with my nervous habits but at times it can drive her nuts. Unfortunately, my tense mannerisms have just gotten worse since Sloan was born. We have our distinctive driving habits for sure. I could probably speed up a bit behind the wheel. When it comes to Sid, based on her driving record (it is pretty good), I can’t really argue with her style that much. My question is this: Am I the only guy in a marriage who is the more timid driver? Or do other dudes out there have spouses who put them to shame? Asking for a friend. Don’t Blink. To be recognized as a dad was very special. After years and years of celebrating the day in the name of others, I was one of the celebrated. Before I jumped in the shower to get ready for church, Sidney and Sloan called me out to the living room. When I stepped out of the bedroom, Sloan was “holding” a card for me. It was from both her and Sid. I read it aloud, emotions creeping up on me with each word. 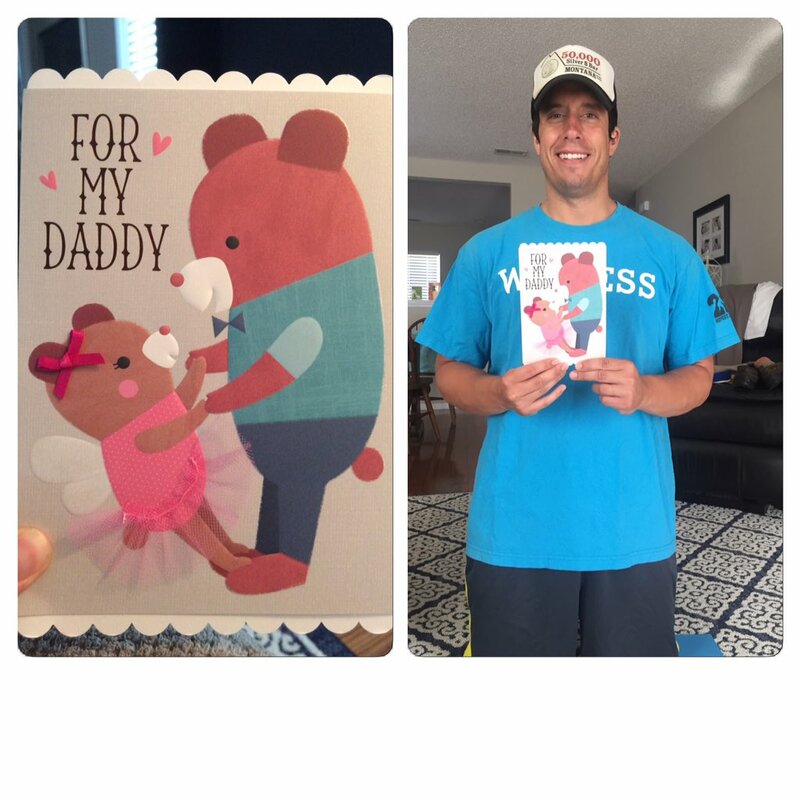 Sloan gave me my Father’s Day card. On my inaugural Father’s Day, I just want to thank my two girls. First, thank you to Sloan. She made me a daddy! On March 17, 2017, my life changed forever. When she arrived, I was no longer just a regular dude. I was a dad. No one will ever be able to take that title away from me for the rest of time. Sloan and mommy picked out a great card. Second, thank you to Sidney. She gave me the single greatest gift in the world and, believe me, she worked extremely hard for it. I will never be able to adequately express my gratitude to my best friend for giving me life’s best blessing. 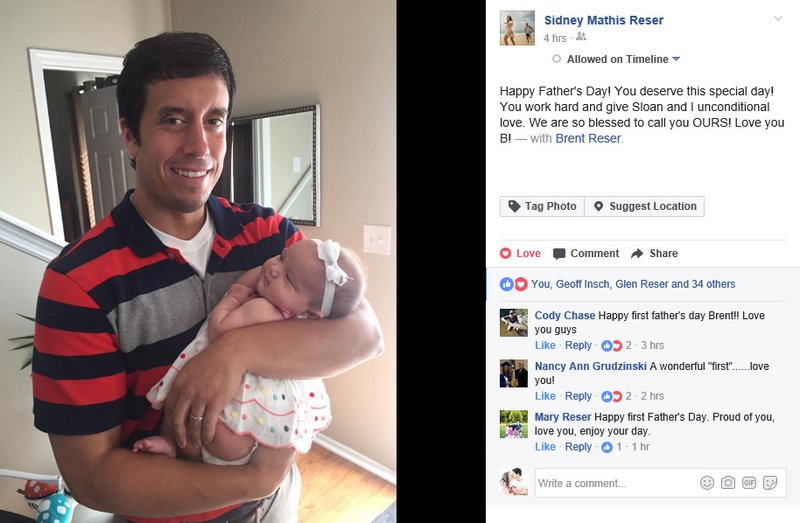 Sidney wrote this sweet Facebook post for me today. The photo was taken right before we left for church. Happy Father’s Day to my dad, my father-in-law, and my two brothers-in-law. It is an honor to join your prestigious club and there isn’t a moment that I don’t consider myself lucky. Don’t Blink. How can you not enjoy this time of year? We are experiencing the longest days of the year. It is so refreshing to travel to work in the daylight and so nice to see the sun stay out until 8:30 p.m. I hope everyone is appreciating it. Time for the Thursday Rundown. Father’s Day Is Coming – It is still pretty weird to think that I will be one of the celebrated this Father’s Day. 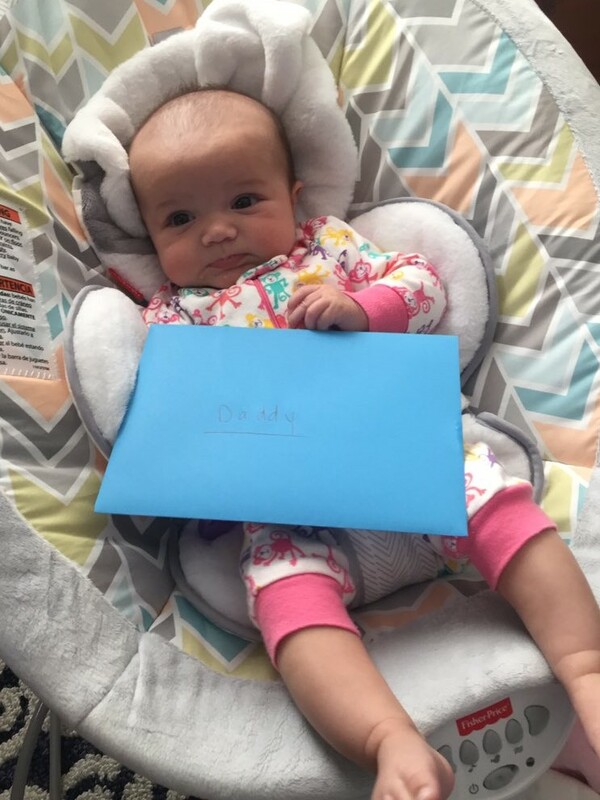 However, this feeling was subdued just a bit earlier this week when I got my first ever Father’s Day card from my sister. It also came with a book. On Tuesday night, we had our friends and marriage counselors over for dinner and they brought me a gift as well. Tim and Kathy gave me a couple books to read Sloan and an adult book about fatherhood for me. This upcoming Sunday should be special. 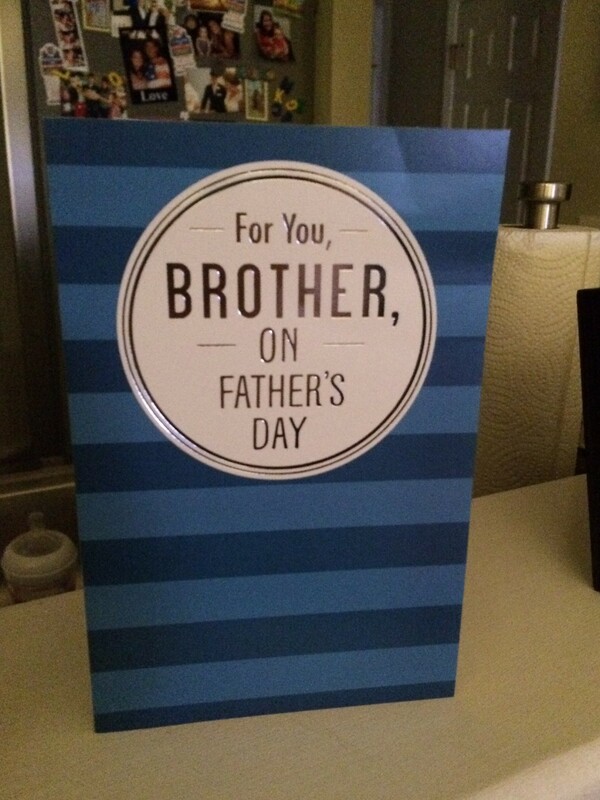 This was the first Father’s Day card I ever received. It came earlier this week and was from my sister. RIP Adam West – The original Batman, Adam West, recently passed away. It was a sad day for my dad. You see, Adam West was born in Walla Walla, Washington, the hometown of both my parents and my “home away from home” during my childhood. It brought my dad great joy to tell others that Batman came from “the place so nice they named it twice.” Technically he can still make that claim but now it is just a little different because West has passed. Summer Social Media Fun – During the summer, social media engagement usually lessens for institutions of higher education. Because of this, it is important for social media professionals to get creative. At the start of the month, I debuted a couple of summer campaigns for our Coastal Carolina social media audience. On Facebook I am running Real Teal Advice. I send our alumni cards and they literally write out advice to current students on how they can maximize their time at CCU. Alumni then send me an image of themselves and an image of their card and I combine them into a post. On Instagram I am running a campaign called Four-Legged Friends of #CCU. Students and alumni send me photos of their dogs on campus and I post them to our Insta account with information on both the dog and the student/alumnus. I run both of these features three times per week. So far so good! A look at what the two campaigns, Real Teal Advice and Four-Legged Friends of #CCU, look like. Swimming With Dolphins Memory – I needed to share this happy memory. Exactly one year ago today, Sid and I swam with dolphins in Isla Mujeres. 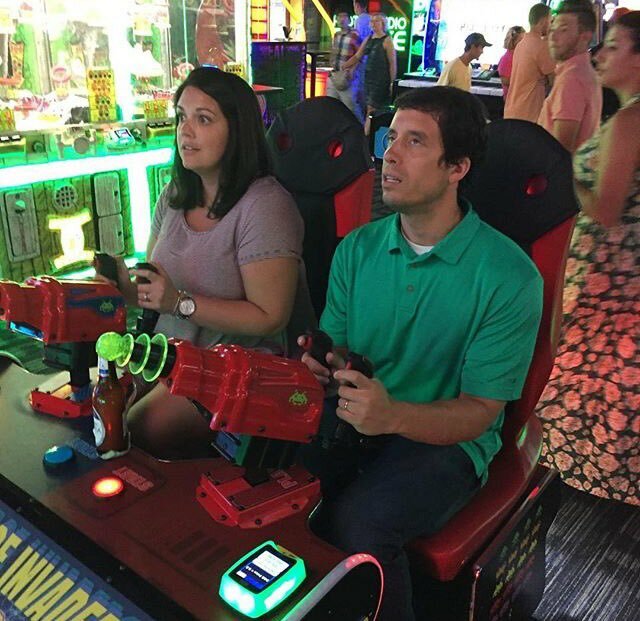 It was something Sidney had always wanted to do and we were lucky enough to check it off the bucket list while on our honeymoon. The dolphins put on a great show and we got to spend some up close and personal time with them. What an experience it was! 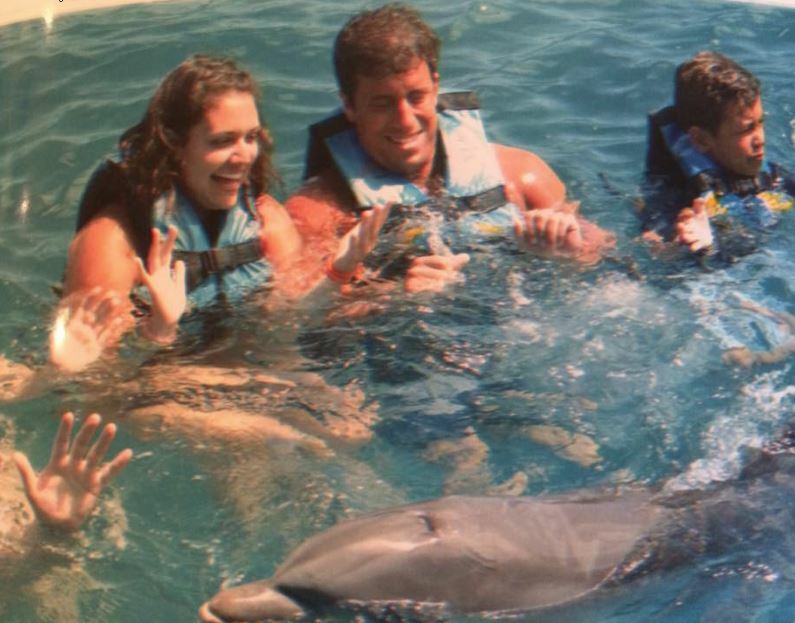 A photo of Sidney and I swimming with dolphins a year ago. 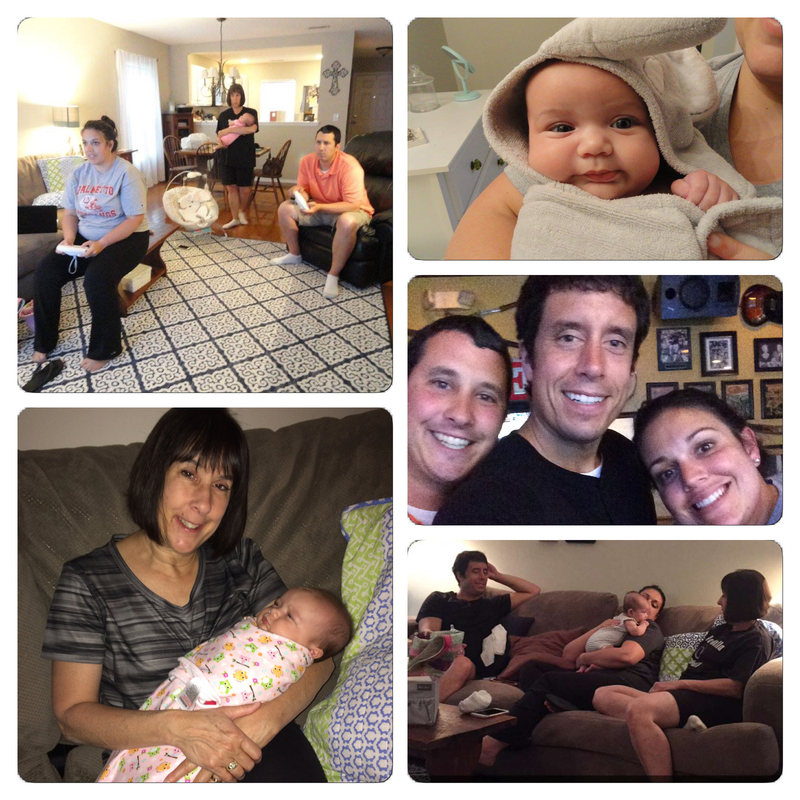 The Latest of the Latest Sloan Photos – I mentioned that Sloan had a wonderful month of May. Well, it is now halfway through June and if it keeps going this way then this month will actually top last month. With her west coast grandma and uncle coming to town soon and her baptism approaching, it looks promising that June will end with a bang. 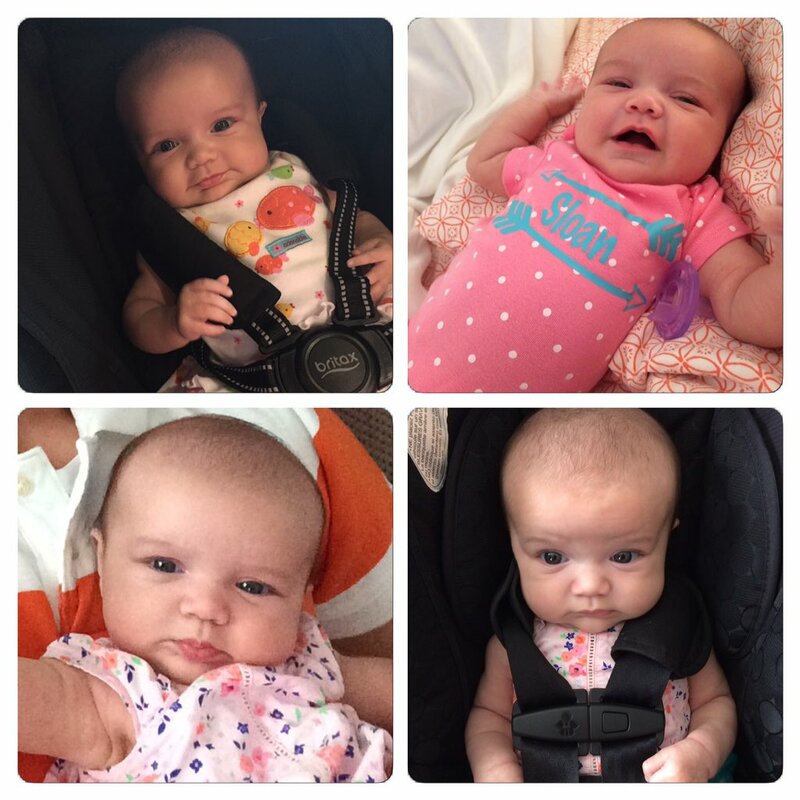 Here is the latest Sloan picture collage. Sloan turns 13 weeks tomorrow. Here is the latest photo collage. Time to wrap up this blog post so I can hang with my wife and daughter. I hope everyone has a terrific weekend. As always, thank you for reading. Don’t Blink. This morning, a sickening attack occurred in Alexandria, Va., at a congressional baseball practice. The politicians were preparing for a major charity event set to take place tomorrow. By the grace of God, no victims lost their lives. I am not a political person. However, that is not why I won’t address the specifics of the political hate that was involved. Yes, a certain political party was targeted by a supporter of a rival political party. But to me, violence is violence. It doesn’t matter what ideology the attempted murderer subscribed to or the presidential candidate he supported. What he did was wrong. Tonight, I have to stand behind what the President said. He called for unity, he noted that everyone on that ball field was a public servant, and he reminded us that we are “blessed to be Americans.” A message we can all agree with, right? It is time to come together. It is time to respect different views. It is time to move forward. No matter what political beliefs we hold dear, like President Trump reminded us, we are blessed to be Americans. Hello! We live in a country that celebrates different views and gives us the opportunity to advance them. How fortunate can we be?! There is no reason we should ever resort to violence, let alone attempt to take the life of someone else, just because we don’t agree with them. We can all do a better job at improving the climate in this country. It starts with just basic civility. We can all pledge to respect our government. From the president to the senators to the locals on the city council, they deserve our gratitude for their service. Do we have to agree with them? Of course not. But we can honor the democratic process and acknowledge their right to do the job they were elected to do. I know my readers would never do anything horrendous like that troubled man did today. However, we can focus on the little things. We can clean up our social media posts, monitor what we retweet, refrain from crude comments, talk appropriately around children, and not act so bitter. Whether or not we like the government that is representing us currently, we can conduct ourselves in a way that is respectful toward our elected officials. Don’t Blink.